A very rare Vogelaar. Wings are attached with Allen bolts. This beauty is in a private collection and the owner wishes to remain anonymous. 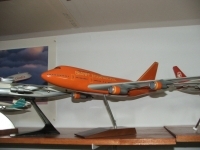 A 1960s model out of the Boeing Model Shop. Mint condition. I sold it off about 10 years ago.